Dark Green Religion is a rare combination of depth, breadth, and readability. Bron Taylor argues successfully for examining nature religion as a single, though diverse tradition on par with other more traditional religions. He also breaks nature religion out of its mold as merely an amorphous mixture of paganism, animism, and environmentalism. Dark Green Religion begins with an overview of the terms to be used throughout—a move that offers some orientation to a terminologically rich analysis. This discussion of terms and definitions of religion reminds the reader that Dark Green Religion is an academic work, not a manifesto on the green spiritual revolution. In addition, Taylor buttresses his writing with a wit and personal voice that brings an added dimension to his analysis. Following the initial chapter, Taylor describes the contours of dark green religion by offering a fourfold typology of dark green positions: Spiritual Animism, Naturalistic Animism, Gaian Spirituality, and Gaian Naturalism. He identifies well-known environmentalists, such as Jane Goodall, Gary Snyder, and Aldo Leopold, with each type, offering a helpful illustration of each form of dark green religion. However, the porous nature of the boundaries separating these four types becomes immediately apparent, as one sees that nearly all of these representatives of each type have affinities with other positions. Throughout the work, the distinction between naturalism and spirituality proves more consequential than the distinction between animism and Gaian earth religion. Those whose thought is characterized by spirituality or supernaturalism tend to be willing to entertain more traditionally religious or metaphysical, articulations of dark green religion, while those associated with the naturalist position are less inclined to rely on metaphysical terminology to explain their experience. This distinction highlights Taylor’s emphasis on family resemblances, but it also raises the question of whether a thicker line separates dark green religion from a nonreligious dark green worldview. It should be noted that, while the presentation of the various representatives of dark green religion does not significantly clarify the distinctions between the four dark green religion types, these biographical narratives provide concrete illustrations for what Taylor discusses in the following chapters. These illustrations make the text approachable for readers not accustomed to thinking about religion theoretically. After dealing with these theoretical and methodological issues, Chapter Three provides a historical overview of dark green religion in North America. Chapters Four through Seven flesh out the extent and scope of dark green religion in the contemporary world. Chapters Four and Five analyze radical environmentalism and surfing (which Taylor dubs “aquatic nature religion”) as forms of dark green religion. Taylor argues that environmentalists are motivated by their belief that nature is a living entity and that animate and inanimate beings in nature are deserving of moral considerability, a belief that is often rooted in one or more experiences of “nature as subject” (to use Eric Katz’s phrase). The chapter on surfing reveals that Taylor intends to take as religion any experience described as religious. The importance of experience which individuals describe as religious is a strong undercurrent throughout the book and one which contributes greatly to Taylor’s interpretation of religion. In the next two chapters Taylor attempts to illuminate the ways in which dark green religious themes are present in society. Exploring the presence of dark green themes in popular media like Disney and the Discovery Channel, as well as in nature writing, photography, and museums, Taylor seems to have lifted the rug on a pervasive force of societal change. These chapters are insightful and provide a wealth of resources in an accessible and readable fashion, and the arguments made here will undoubtedly spark lively discussions. There is much to commend here, and my only major critique of the book regards the strategy of proposing the phrase “dark green religion” as an organizing principle for the material that Taylor presents. We are offered a definition of “dark green religion” from the opening pages: “religion that considers nature to be sacred, imbued with intrinsic value, and worthy of reverent care” (ix). The emphasis on analyzing family resemblances (2-3) works well within these parameters and allows Taylor to cast as wide a net as needed in an effort to present a tangible picture of dark green religion. However, this approach to conceptualizing religion seems to stand in contrast with his other efforts to set “dark green religion” off from “nature religion” and “green religion.” He equates “green religion” with religious environmentalism, or the development of environmental concern by the world’s religions. But what sets these off from dark green religion is that environmental concern is viewed by the former as a “religious obligation” (10). The use of the term “parareligion” to describe Gaian Naturalism and Naturalistic Animism likewise seems unnecessary if entertaining a broader notion of religion and reinforces the question of whether there is a deeper divide between the spiritual and naturalistic poles of dark green religion (155). Taylor defends the use of “dark green religion” on the basis that the term is relatively free from critical baggage (223) and also that the modifier “dark” simultaneously highlights the dangerous tendencies of dark green religion as well as the depth of commitment of its adherents. But once again, while acknowledging the pedagogical benefits of using fresh term, we do not describe other religions as “dark” even though strands within the tradition may tend towards violence or mysticism. Thus, I wonder whether it would not have been more constructive to redress the history and scope of a term like “nature religion” and reposition it in light of Taylor’s unique observations and analysis. These criticisms are mitigated, though, by the observation that one of Taylor’s basic intents is show that dark green religion challenges assumptions about how religion is to be understood. 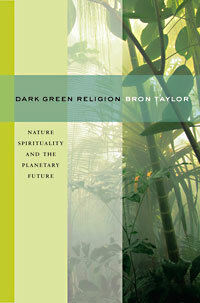 Overall, Dark Green Religion is a unique contribution to the field of religion and ecology. It shifts the ground from (religious) ethics to (religious) experience. Moreover, Taylor’s recasting of nature religion as dark green religion brings into focus the social impact of the movement, opening new avenues for scholars outside of religious studies. The central questions Taylor raises—if we admit dark green religion exists as religion, how does this challenge or change our understanding of religion? In what ways will dark green religion impact society in next decades?—are not only worthy of careful consideration, they provide a nexus for a new horizon of humanities research.